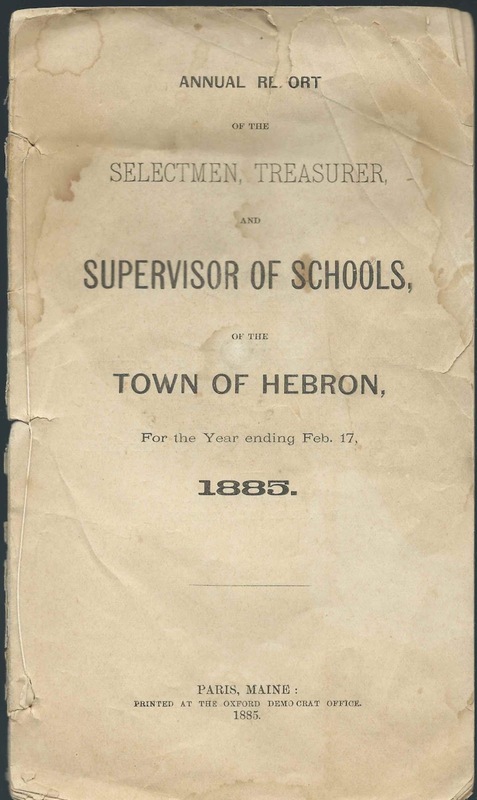 Annual Report of the Selectmen, Treasurer and Supervisor of Schools of the Town of Hebron, for the Year ending Feb. 17, 1885. Hebron is a town in Oxford County, Maine. 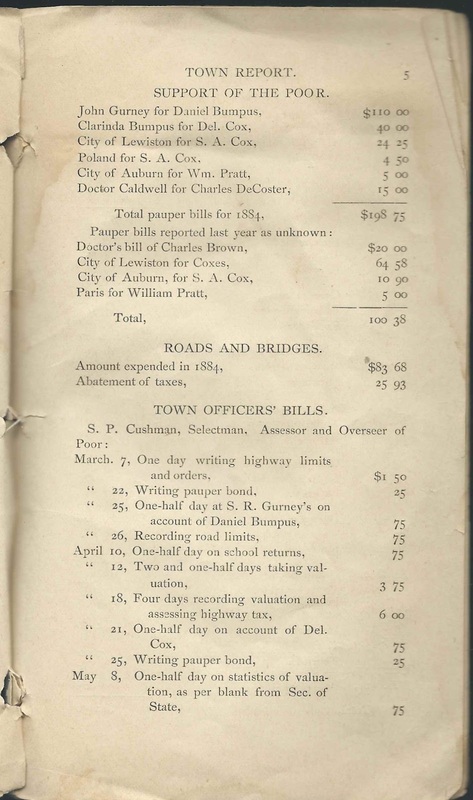 The report, printed at the Oxford Democrat Office at Paris, Maine, in 1885, is approximately 8-1/2" by 5" and consists of 15 pages of text. The front cover is missing. 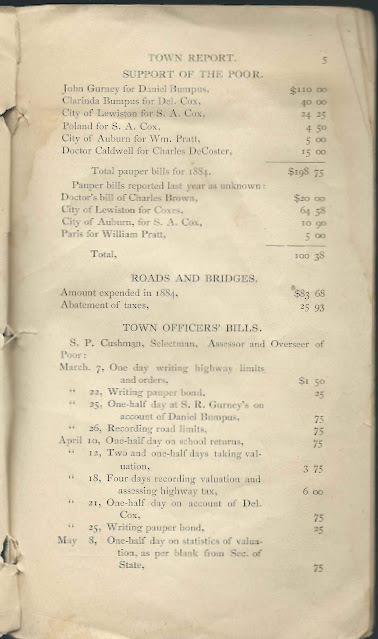 Any names are transcribed under the appropriate page. The School Supervisor's Report, by S. D. Richardson, Supervisor, at Hebron, dated February 28, 1885, contains interesting genealogical information. See those pages after a brief synopsis. District No. 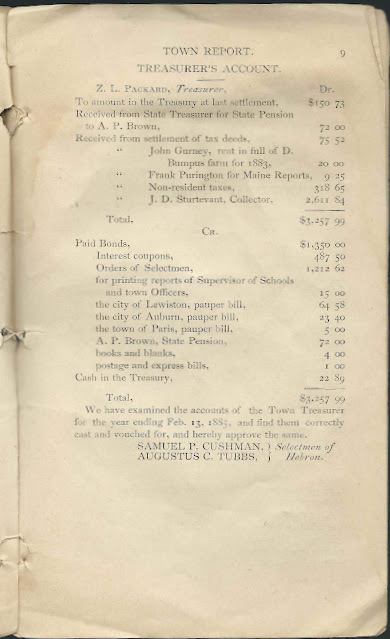 2 - V. A. Bumpus, Agent. "The summer term was taught by Miss Addie M. Marshall, with her usual good success." 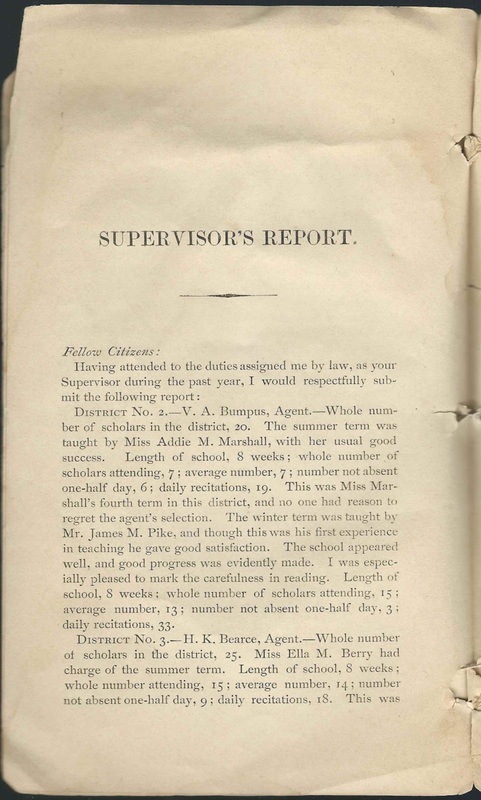 "The winter term was taught by Mr. James M. Pike, and though this was his first experience in teaching he gave good satisfaction." District No. 3 - H. K. Bearce, Agent. 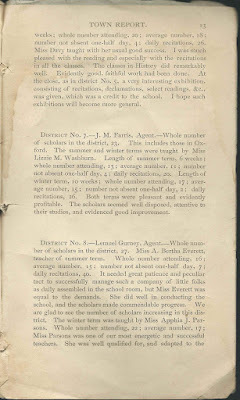 "Miss Ella M. Berry had charge of the summer term... 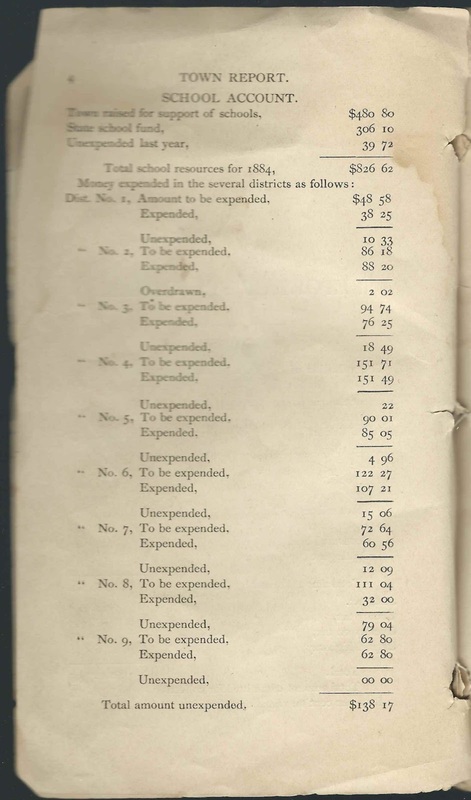 This was Miss Berry's second term in this district, and it was evidently a profitable one. 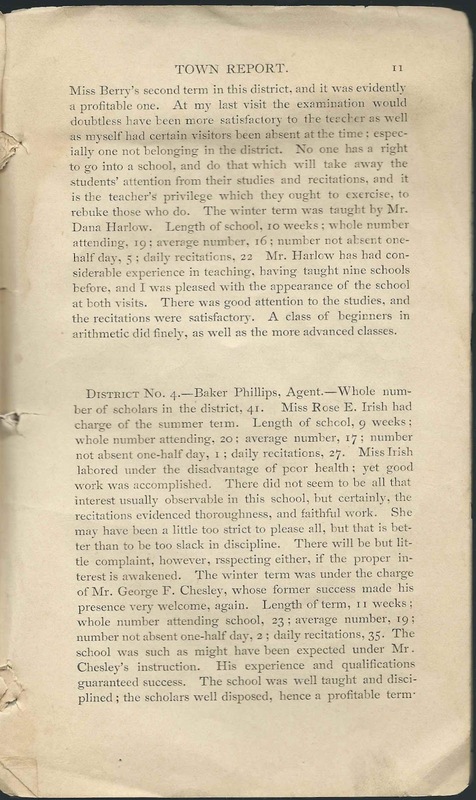 At my last visit the examination would doubtless have been more satisfactory to the teacher as well as myself had certain visitors been absent at the time; especially one not belonging in the district. No one has a right to go into a school, and do that which will take away the students' attention from their studies and recitations, and it is the teacher's privilege which they ought to exercise, to rebuke those who do. The winter term was taught by Mr. Dana Harlow... Mr. Harlow has had considerable experience in teaching, having taught nine schools before, and I was pleased with the appearance of the school at both visits. There was good attention to the studies, and the recitations were satisfactory. A class of beginners in arithmetic did finely, as well as the more advanced classes." District No. 4 - Baker Phillips, Agent. "Miss Rose E. Irish had charge of the summer term... Miss Irish labored under the disadvantage of poor health; yet good work was accomplished... She may have been a little too strict to please all, but that is better than to be too slack in discipline. There will be but little complaint, however, respecting either, if the proper interest is awakened. 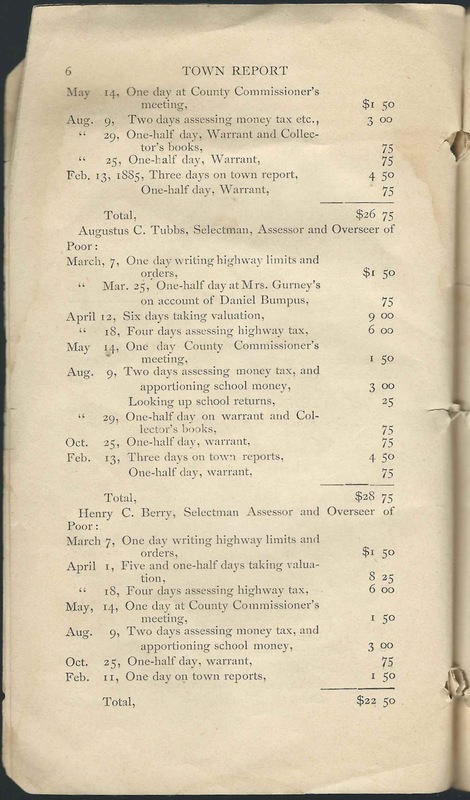 The winter term was under the charge of Mr. George F. Chesley, whose former success made his presence very welcome again... The school was such as might have been expected under Mr. Chesley's instruction. His experience and qualifications guaranteed success. 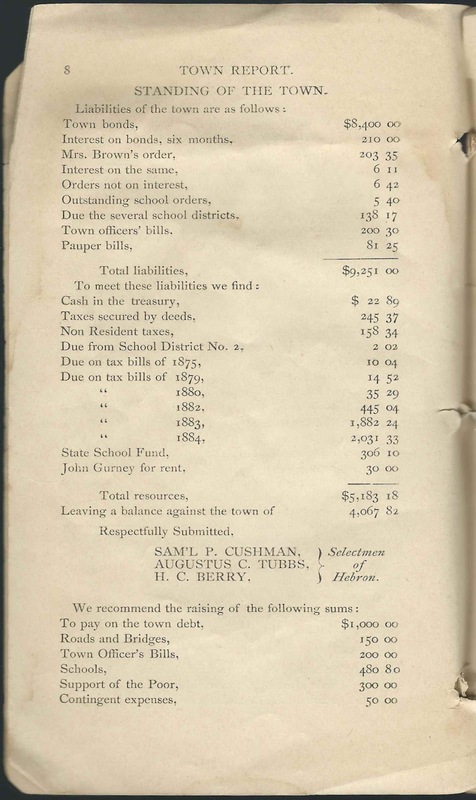 The school was well taught and disciplined; the scholars well disposed, hence a profitable term." District No. 5 - Sylvanus Bearce, Agent. "Miss Minnie A. Davy, teacher of summer term. 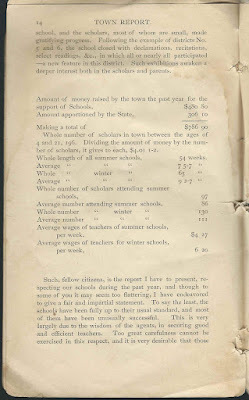 "The school made satisfactory progress under Miss Davy's instructions. She secured the good will of the scholars, and they evidently tried to make the school a success and it was so. I was pleased with the general appearance and with the progress made. For the winter term, the Agent was fortunate in securing the services of Miss Lizzie P. Hammond... Miss Hammond came to the school well qualified, and with the needed tact to insure success. She at once won the affections and confidence of the scholars, and seldom have I seen so good an interest manifested by all, as was there seen throughout the term. The reading and recitations gave evidence of thorough work. It was a very profitable term. At the close, under the direction of the teacher, an exhibition was given by the pupils, in which all participated, that reflected great credit upon each." District No. 6 - Z. L. Packard, Agent. 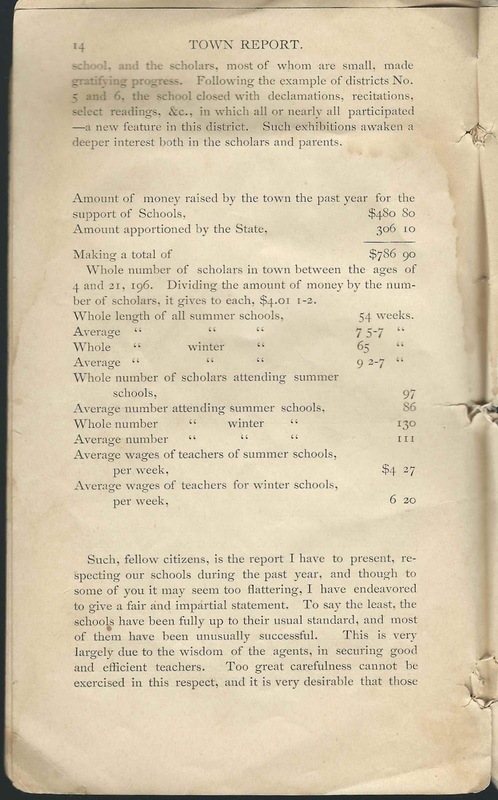 "Miss Bertha L. Packard taught the summer term... Miss Packard had taught this school several terms, and always with good success, and this was no exception. She manifests a deep interest in her scholars, and they are naturally attracted toward her, consequently the school under her instruction always moves along pleasantly and profitably. It was so in this case, and satisfactory to all. 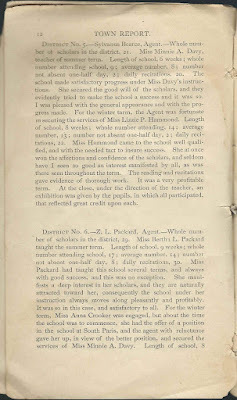 For the winter term, Miss Anna Crocker was engaged, but about the time the school was to commence, she had the offer of a position in the school at South Paris, and the agent with reluctance gave her up, in view of the better position, and secured the services of Miss Minnie A. Davy... Miss Davy taught with her usual good success. I was much pleased with the reading and especially with the recitations in all the classes. The classes in History did remarkably well. Evidently good, faithful work had been done. At the close, as in district No. 5, a very interesting exhibition, consisting of recitations, declamations, select readings, etc., was given, which was a credit to the school. I hope such exhibitions will become more general." District No. 7 - J. M. Farris, Agent. 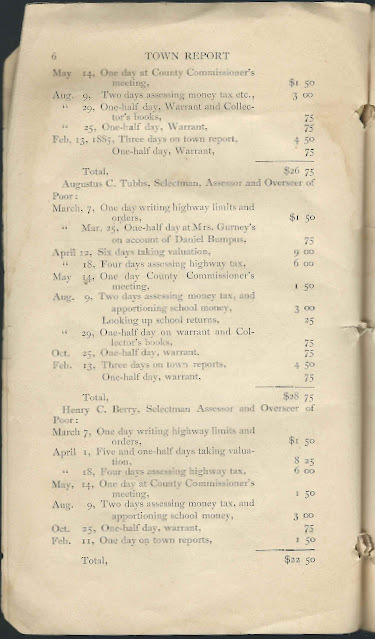 "The summer and winter terms were taught by Miss Lizzie M. Washburn... Both terms were pleasant and evidently profitable. The scholars seemed well disposed, attentive to their studies, and evidenced good improvement." District No. 8 - Lemuel Gurney, Agent. 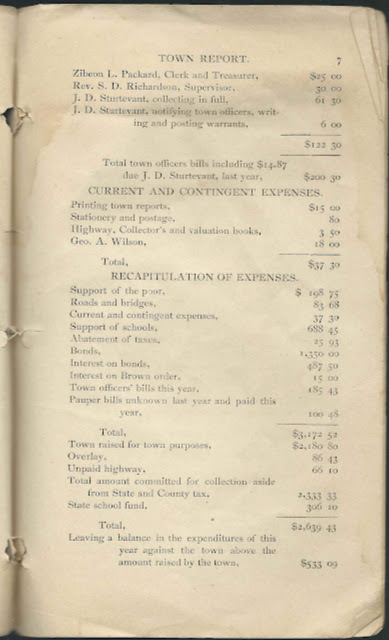 "Miss A. Bertha Everett, teacher of summer term. 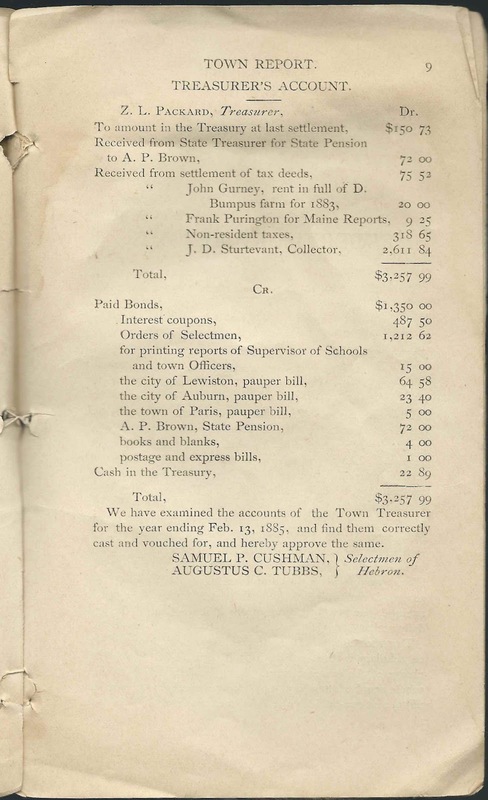 "It needed great patience and peculiar tact to successfully manage such a company of little folks as daily assembled in the school room, but Miss Everett was equal to the demands. 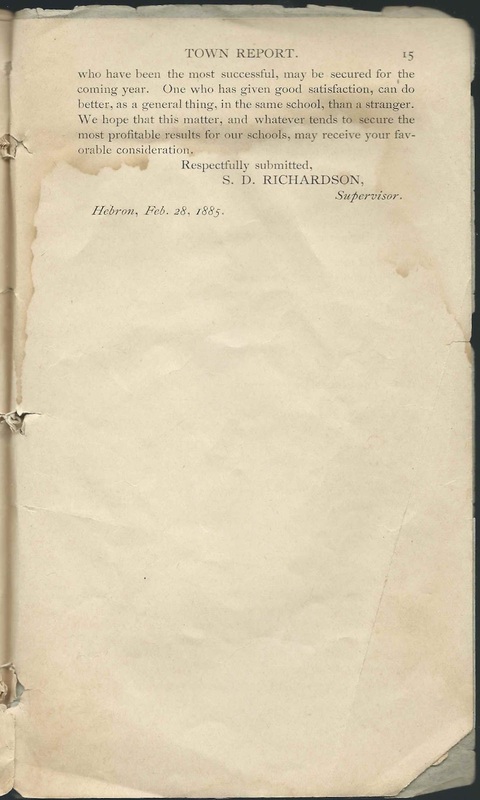 She did well in conducting the school, and the scholars made commendable progress." "The winter team was taught by Miss Apphia J. Parsons.... Miss Parsons was one of our most energetic and successful teachers. She was well qualified for, and adapted to the school, and the scholars, most of whom are small, made gratifying progress. 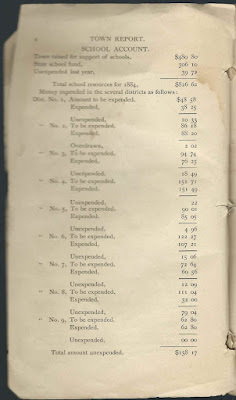 Following the example of districts No. 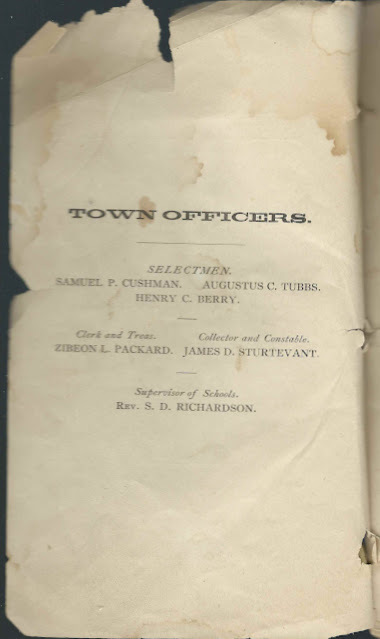 5 and 6, the school closed with declamations, recitations, select readings, etc., in which all or nearly all participated - a new feature in this district. Such exhibitions awaken a deeper interest both in the scholars and their parents." 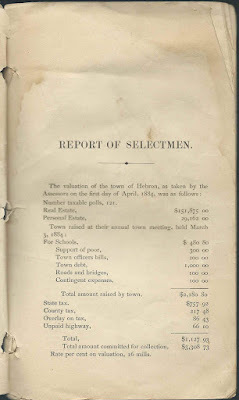 If you have information to share on any of the people mentioned in this Annual Report, please leave a comment or contact me directly.